Drab, but with yellow on face. “Drab, but with yellow on face” is how the Yellow-browed Sparrow is described in The Birds of Ecuador. While that is a fair, if maybe a bit harsh, description of Ammodramus aurifrons, I prefer to describe the lovely sparrow with slightly different words. Words indicative of devotion and desirability. Words like awesome, astounding, and amazing. And can you blame me? After all, the unassuming little sparrow was my 1,000th bird species! Seeing 1,000 species of bird has taken me over five years of birding on four continents. 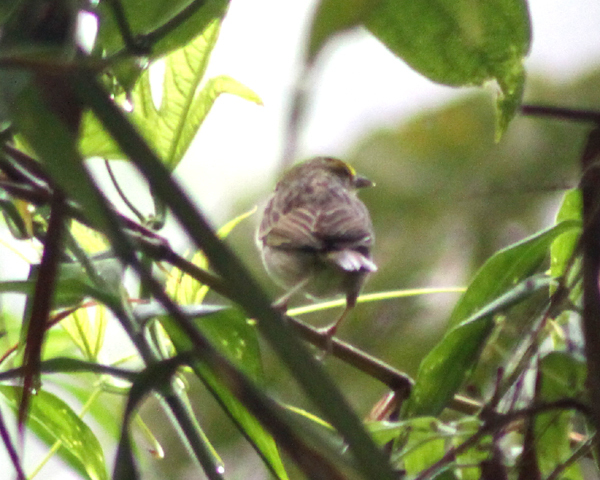 So when that little yellow-and-brown bird hopped along the edge of a path in the rain at Wildsumaco Lodge in the eastern foothills of the Andes, well, it felt pretty good. Especially considering that the day before I had managed to add exactly twenty-one species to my life list, bringing me to 999 species. But I am getting ahead of myself here: let me go back and start this story properly. I arrived in Ecuador having seen 785 species of bird in my life. A week of dawn-to-dusk birding had brought the total to 999 species, including stunners like Crested Quetzal, Long-tailed Sylph, and Black-faced Ibis. Our birding on Wednesday had ended with us* picking through foraging flocks in a very thick fog that made every bird look like a mere shadow of itself. Color was almost nonexistent except for the green of the lush plant life. Despite the weather conditions and the fact that we were birding from a narrow trail with treacherous footing on a steep slope we managed to do rather well, and birds like Green-and-Black Fruiteater, Saffron-crowned Tanager, and Lacrimose Mountain-Tanager were all checked off the checklist. Then new birds stopped coming. At least, new birds that we could identify in the water masquerading as air stopped coming. The trudge back to the van was a downer, at least for me. Though I held out hope that one more new bird would show itself well along the trail or on the ride back to our lodging, I knew it was unlikely, especially when the fog finally stopped fooling itself and turned to rain on our ride. Dinner was good and the night’s sleep was appreciated. The three-hour drive east and down to Wildsumaco Lodge was enlivened by the occasional fly-over, unidentifiable bird in the increasingly heavy rain. Even the one bird we put a name to on our bathroom break ended up being Russset-backed Oropendulas, a bird we had spotted the day before. When we finally arrived at Widsumaco Lodge it was still raining and we decided to bird the grounds from under cover of the buildings while we waited for the downpour to end. Because I was so intent on finding a new bird I had all my gear ready and was the first to get in position under an overhang from which I spotted a little brown bird working the edge of the path. The identification was not difficult and I had my 1,000th bird. Somehow, it seems appropriate that such a milestone bird would be an LBJ. And, no, I am not at all bitter that bird number 1,001, seen a mere five minutes after the sparrow, was a Paradise Tanager, a bird that looks every bit as stunning as one would expect from a bird with “paradise” in its name. Nor am I bothered by the fact that while I saw forty-five species of hummingbird and forty-seven species of tanager while I was in Ecuador it was one of the three species of sparrow that I saw on the trip that happened to be the magical number 1,000. *”Us” being me, Renato, and four intrepid birders from Queens. I have no idea what my 1000th species was. Perhaps I should sort my notes out so I can work out what my 200th is when it happens. I can’t believe anyone could consider any member of the genus Ammodramus anything less than worthy. A fine #1000! Congrats! Though that Paradise Tanager would have been nice too. Congrats. sounds like a fun trip. Lacrimose Mountain-Tanager? You made that up. Though on second thoughts I have had some birds responsible for “inducing tears” if not actually “given to weeping” themselves. Congratulations again Corey! I think you had this little drab coming since you did not want to look at any other little birds on the road to Wildsumaco. And, yeah, Nate, an Ammodramus is usually a bird I am a fan of but this species was not the typical skulky Ammodramus. I’ll give you that. Ammos are awesome when it’s a cold windy day on the shore and you pop them up out of a saltmarsh after tromping through mud and muck. Sometimes though, you just want a Paradise Tanager. I cannot find fault with that. Even as someone who has only ever seen a Paradise Tanager in my most lucid fever dreams. Congratulations, Corey! What an awesome achievement. And I love how you perpetually take birds that others thumb their noses at, like sparrows, and make them interesting and special. I am not with Nate anymore. An Ammo is an Ammo is an awesome bird no matter what. I got my 1,000th bird in Ecuador too… a Great Jacamar! Then I went and updated my checklists and moved my lists from avisys to ebird and my “new” 1000th bird is now a Swallow-winged Puffbird. Can’t complain about either of those! Maybe there will be lump in the next taxonomic revision and your Paradise Tanager will move down to 1000th place. Are Twitchers Killing the Planet?